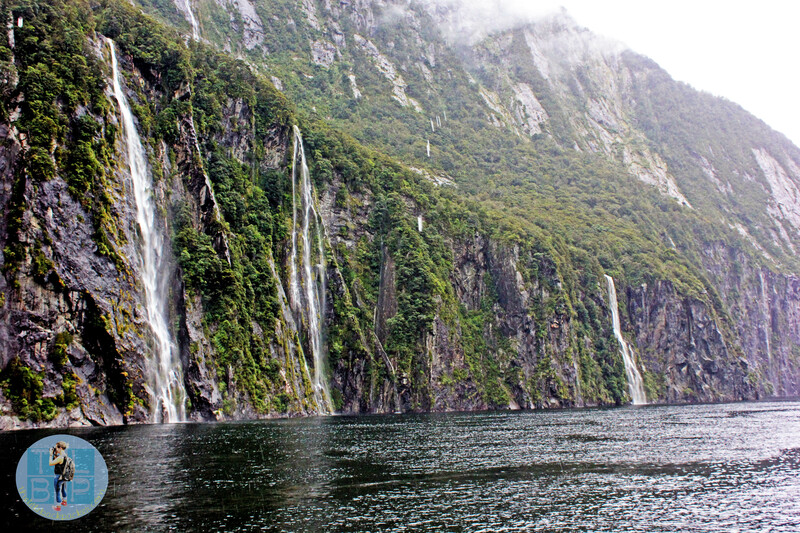 There are so many options with trips to Milford Sound, so to make it easy we booked up the Milford Explorer ticket with Kiwi Experience when we purchased our passes. 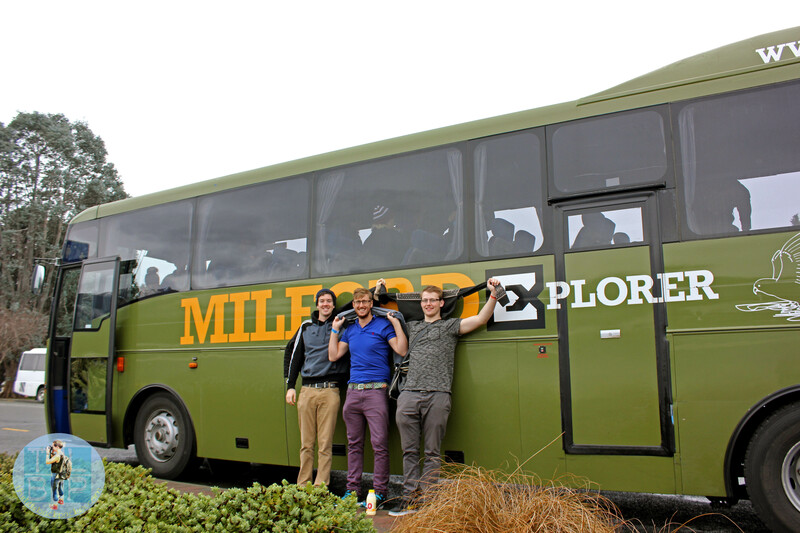 For me it was a must do trip and I knew no matter how drunk I got in Queenstown I would still be getting on the bus. As it was I didn’t get too drunk and the long coach ride wasn’t too horrific. We were up early to be picked up at 7.30am by our bus driver Jamie. After a few stops around town picking up the others we headed off in the direction of Te Anua. It took a while to get there, so in that time most people slept – there is not much to look at scenery wise. Te Anua was our first stop of the day and a complete tourist township, due to it being the gateway to the National Park. We didn’t stop here long, just enough time to grab something to eat in the café. Just a word of warning: avoid the town toilets which charge $1 for use. From here it was onwards to the Fiord Land National Park. With one road in and out during the winter time it is very important to check the weather conditions and any warnings that have been issued. Luckily the day we went everything was swell, however on other days that isn’t the case. The road in to the national park was opened to the public in 1952 and was originally only open in the summer, due to the harsh winter weather conditions and risk of avalanches. These days the road is open all year around – they closely monitor the mountains and if there is any sign of an avalanche the road is closed, dynamite is used to blast the avalanche manually before clearing and reopening the road. All in all, the road is open 80% of the year. We made a few stops on the way in to the park: Knobs Flats and The Chasm as well as an information hut. The views became more and more incredible as we drove deeper in to the park. There was an abundance of waterfalls popping up as the rain grew harder – this was typical weather for the national park as it rains every 2/3 days. It is a temperate rainforest (not tropical) and this explains why is receives so much rain but can cope so well. We hit the Homer Tunnel and drove through the mountain towards the water inlet and Milford Township. We arrived about 10 minutes before our boat was due to leave, we had a well needed leg stretch but there was not enough time to walk further than the boat terminal. 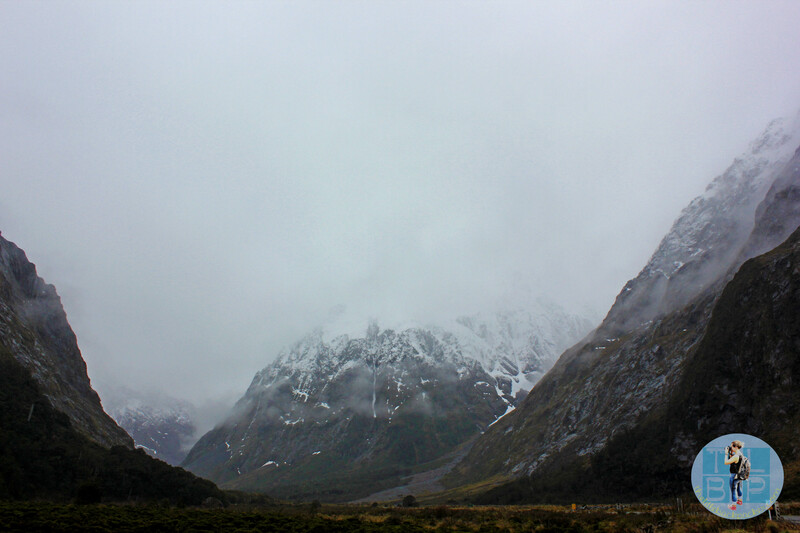 It was a pretty cloudy day all round with some low clouds hanging at the tops of the mountains. This meant there was no beautiful mirror reflection on the water but an amazing amount of waterfalls surrounded us instead. Apparently once the rain stops 90% of the waterfalls disappear within two hours! We were lucky in some ways to get to see all the waterfalls in their glory but also unlucky not to see the mirror reflection. The cruise itself lasted about an hour and 45 minutes and we were provided with a cold lunch. It took us right out to the Tasman Sea and up to the edge of the waterfalls causing anyone on the front deck to get soaked. Being outside on the boat was very wet, cold and windy – I never lasted more than a few minutes before rushing back in to relax for five. The conditions were not great for using my camera in as I found the lens constantly covered in raindrops – luckily I had a carrier bag with me and was able to protect my camera body using that. As we came back in to the harbour there was a break in the clouds and the sun started to shine through a little. Unfortunately it was the end of our cruise and there was no time to hang around to see if there would be a good opportunity to grab a mirror refection photo. We were straight back on the bus from the boat and then except for another stop in Te Anua that was us until we got back to Queenstown. I enjoyed the first part of the drive out from Milford as there was some gorgeous blue sky about and a little sunshine. Soon after that the rain set in again and darkness wasn’t far behind – the journey back then seemed to take forever. Overall the day felt very crammed – I understand that to get there and back in a day you have to stick to a schedule, however I felt there was absolutely no give in that schedule. Ideally I would have spent a night in the Milford Township but being the winter months I would have ended up there for several nights until the next bus was due. In one day this is a very crammed itinerary and if anyone is late then they ruin it for everyone else. The stops really are kept to a minimal and you have no time to explore any of the township or wait five minutes for the sun to come out. The captain on the cruise boat and our bus driver Jamie had an incredible amount of knowledge to tell us about the whole national park area. Their facts just kept coming and no question seemed to faze them. We were lucky enough to see penguins the day we went which only happens about half a dozen times a year! Our day was described as a good rain day, with sightings of penguins and seals, an amazing array of waterfalls and some lucky breaks in the cloud. I would recommend this trip if you are very tight on time; however if you can spare a night in the township I would think that would make the trip a lot more beneficial – the 12 hours on a coach was tough going in a day!